You are here: Home » Featured » American pastor freed after two years in Turkey returns to U.S.
American pastor freed after two years in Turkey returns to U.S. The Rev. 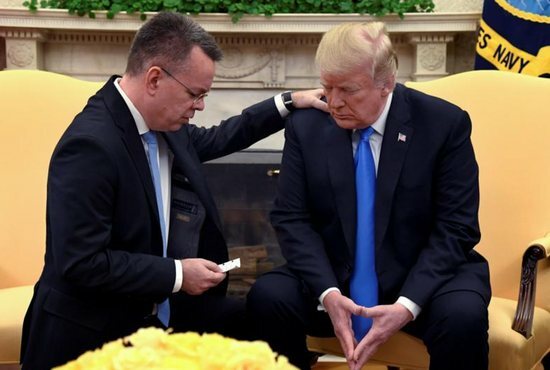 Andrew Brunson, an evangelical Presbyterian pastor who had been jailed by Turkish authorities for nearly two years, returned to U.S. soil Oct. 13 after being freed the day before by Turkey. Rev. Brunson, who had been held without charges for a year, was convicted Oct. 12 on a charge of aiding terrorism and sentenced to time served. After his captivity brought an outcry from religious freedom circles in the United States and elsewhere, he was moved to house arrest, and the Trump administration placed sanctions on the Turkish officials deemed responsible for holding Rev. Brunson. During an Oct. 13 meeting at the White House with Rev. Brunson, President Donald Trump said he welcomed his release, but added no deal had made with Turkey to secure it. He also rejected the notion that Rev. Brunson’s release had anything to do with Turkey wanting the United States to back up its assertion that Saudi journalist Jamal Khashoggi was murdered inside the Saudi Arabian consulate in Istanbul earlier in October. Turkey was still dealing with the aftermath of a coup attempt at the time of the pastor’s arrest. Authorities were rounding up anyone suspected of plotting the coup or sympathizing with them. Rev. Brunson, a North Carolina native, was suspected of sympathizing with Kurdish separatists in Turkey. Rev. Brunson and his wife, Norine, who had been in Turkey 23 years, were seeking permanent residency status in Turkey at the time of his arrest Oct. 7, 2016. Norine Brunson also had been arrested and held for 13 days before being released. The pastor led a small congregation called Resurrection Church in the ancient city of Izmir. Turkey had originally offered exchanging Rev. Brunson for Muhammed Fethullah Gulen, an Islamic preacher living in exile in the United States and whom Turkish officials believed had backed the failed coup from the U.S. American authorities refused the deal. Speaking July 24 at a U.S. State Department conference on religious freedom, Rev. Brunson’s daughter, Jacqueline Brunson Furnari, said three trial dates for her father had come and gone, adding she believed it was because “there has not been one witness to produce one shred of evidence” to support the charge. “My family has suffered greatly because of the false and absurd charges,” she said. Furnari told of the time she and one of her brothers spent one hour in August 2017 visiting their father in jail — the only time until his release that she had seen him. Furnari got married while her father was imprisoned — but only in a civil ceremony, waiting for him to be freed so he can walk her down the aisle to be married in a church service. In an Oct. 12 statement, U.S. Rep. Chris Smith, R-New Jersey, said he was “overjoyed” the pastor had been released and was “coming home safely” to the U.S. He issued the remarks as chairman of the House Subcommittee on Global Human Rights and co-chairman of the U.S. Helsinki Commission.